Applying Face Lace products is easy and quick. Simply peel off the Face Lace design you want to wear and put it in place. Face Lace products can be applied over make-up but, for best results, we recommend that you apply the product over clean skin with minimal make up. Many primers and beauty balms contain silicon in their formulations. Although this is great for ensuring smoother make-up finishes and better blending it is, unfortunately, not an ideal combination with our Face Lace adhesive. 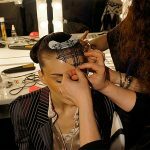 If Face Lace is used over clean skin with minimal make-up and you put it back onto the backing sheet after wearing, you should be able to wear it more than once. Eyelash glue can also be used to enable further wear, if the original adhesive starts to dry.